Paid work is nice because it allows me to afford a small print run of Stray Sod Issue #3, which will be available at our booth later this month, and will be available in the online store in May. Migraines are not so nice–I spent a total of a week of March lying in bed unable to do a thing. But instead of pursuing the drug route, which hasn’t been helping so far, I’m trying chiropractic care. I’ve been waiting for my first adjustment with a specialist, and although I try to be careful not to get too hopeful, I know far too many people who have been helped by this kind of care. And lastly, con season is, I’ve agreed with the artists I share a booth with, the actual Most Wonderful Time of the Year. 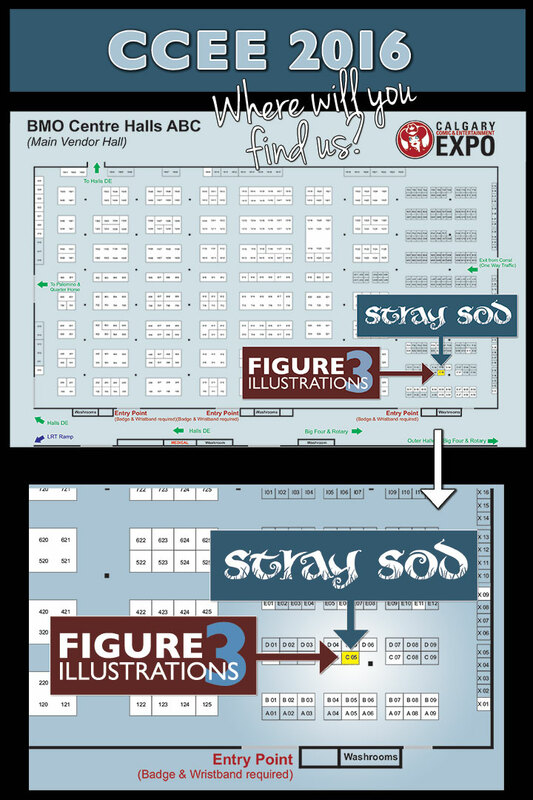 I’m back at the Calgary Comic and Entertainment Expo April 28-May 1 at the Figure 3 Illustrations booth, number C05. That’s near the right-hand corner when you walk in the entry doors. This year, through discipline and a few late nights, I was able to get a piece done for the art book. A limited edition large print is going in the charity auction, and there will be smaller prints available for purchase at our booth. I can’t reveal the image before the show, but I was inspired by one of the Irish folktales I read in my research.